Every notice how sometimes one kid does not seem quite as willing to help as the others? Ever want to say to (read: scream at) that kid -- YOU THINK THAT IF YOU ACT THAT WAY, I WILL STOP ASKING YOU FOR HELP? Every week, I promise myself that I will not lose my temper. Every week, I am determined to just calmly repeat myself until that child completes the task at hand. Every week, I believe "this week will be different." Over time, we have made progress. I know we have. This child does help more. Sometime, even with a smile. I wish I knew the secrect. How do I charm my child into wanting to help? Or, at least, into helping graciously? How do I convey to my child that a good attitude will make the task easier and faster. A friend suggested we "time" the tasks. "See what you can do in five minutes." It is a good tool. Even a reluctant child can accomplish a lot in five minutes. Some weeks are better than others. ps. ALL tips and suggestions welcome!! My parents left last Monday night. I am always sad when they go. I woke up Tuesday morning and the house seemed so quiet. For weeks, when I woke up, I saw my Mom or Dad, sitting in the kitchen or dining room. Now, the house seemed empty without them. My dad was really sick almost the entire time he was here. These days, when my dad comes to Israel, he does not really vacation. He spends most of his time working on his computer. Still, we spend all the "in-between times" together. We eat our meals together, and talk when he has a few minutes of down time (like when he's waiting for a file to download). And, of course, we spend Shabbatot and Chagim together. One of the things both my sister and I really look forward to is cooking with our father. Working with my dad, on anything, is always fun. Whatever he does, he does with energy and a positive attitude. My dad can turn eating a humus sandwich into an adventure. ("Wow, look at that beautiful tomato! That is going to taste absolutely fantastic on this sandwich!") His enthusiasm is contagious! My dad did almost no work this visit. Do not be fooled; that is not a good thing. When I realized my dad was not doing any work, I realized he must be REALLY SICK. I felt so bad for him. And I felt pretty sorry for us. I did not get to work on any of the small projects that I planned to do with my dad. Ever since I was a little girl, I was "daddy's helper." My dad is colorblind, so when he would build electrical things, I would sit at the table and help him sort through the diodes and resistors, which were all color coordinated. To this day, there is nothing I like more that to build/fix something with my dad. I had all sorts of small jobs for us (attaching a light fixture, hanging up mirrors, etc). Nothing too big, or time consuming. Just some small, but very helpful, tasks that we could do together. Needless to say, we did not get to do any of them. The second best thing I like to do with my father is play Pente. We did get to play, a bit. But he was so sick (and out of practice), that I beat him almost every game. We are, more or less, evenly matched, but he really is better than me. So, if he were just out of practice, we should each win about half the time. I was winning a lot more than that, and it just was not fair. One good thing about having my dad here is that he helps make sure I treat my mom right. When I was a kid, my dad almost never took vacation. On the rare occasions that he did, he almost always got sick. It was almost like a bad joke. So, when it happens nowadays, we all laugh at it. Despite their being sick, we did have some nice times. And we did share stories and laugh about all sorts of things. The house is certainly quieter, now that they are gone. And there are less people to worry about (less food to cook, less dirty dishes, less laundry, etc). In some ways, I am glad they are gone. At the same time, I wish they were still here. I miss my parents a lot. When my parents arrived, my kids (read: my daughters) had their beds all set up, including moving in an extra bed frame, a box spring, and a mattress, into my youngest daughter's room. By the time I got home from the airport, the girls had moved everything back (and changed the sheets). In that simple action, they erased my parents' presence. My parents disappeared, without a trace. Life went "back to normal" (at least, as normal as it ever gets around here). So, my doc does not see any change in my CT or in my bone scans, though the images of the tumors seem more "prominant." He wants me to get a PET scan. He also wants me to go for a second opinion. He is perplexed (by the combo of clean liver and lungs, rising markers, prominant bone tumors, and increasing pain) -- he wants a "fresh" opinion, from someone from a different hospital. It is totally cool that he has no ego about this thing, and is actually eager for a second opinion. We'll see how quickly I can make all these appointments, and how much I have to "fight" with my kupah (health fund) to cover the PET scan. Oh, the fun that awaits me! Every year, children from schools throughout Israel participate in a campain known as Mivtza HaKesh BaDelet ("Operation Knock on the Door"). Trust me, it sounds a lot better in Hebrew! Mivtza HaKesh BaDelet is a national fundraiser for The Israel Cancer Association. Kids from religious, and secular schools, go in pairs (or more), and knock on doors, collecting money. There are advertisements on radios, TV, buses, etc, promoting the campaign, and it is quite effective. Thousands of children are involved in collecting money and raising cancer awareness. Though Israel is a very "reward" oriented society, there are no "rewards" for collecting the money. Yet the children are enthusiastic, and polite. And, when I great them at the door, I am proud to be Israeli. My child came home way past dark. Needless to say, I was hysterical. The other mother was not. She calmly reassured me that our kids would come home... eventually. It turned out that our kids were eager to collect as much money as they could, and nobody had bothered to tell them that they should go home by a certain time, whether or not they were finished "their" (assigned) area. Two years later, when my son was supposed to participate, we had a conflict. I suggested to my son that he go with a friend the next day, but he was adamant about participating with the rest of the school. I consulted with the school staff, and they encouraged me to alter our plans and allow him to participate with the rest of the school. We did, and I could see that it was the right decision. It was important to him. This year, many of the parents from my youngest daughter's class, did not permit their children to participate. Some had their children collect from their own neighborhoods, in areas designated for other schools. Some children simply did not participate. Some parents were worried about their kids going out alone. Some parents felt there were better ways for their kids to be volunteering, and/or more valuable organizations that the Cancer Association. I was disappointed that her class would not be experiencing the same group experience as my other kids' classes. I tried to encourage the parents, as I had been encouraged, but there were too many of them. And the anxiety had grown to an irreversible measure. I wondered if it would have been as important to me had I not had cancer. During our email discussion, I refrained from mentioning to the parents that I have cancer. Some know, but not everyone. Since it is important to my daugher to be normal, I did not want to make any more of a big deal about it than I already had. When my daughter came home, the first thing she said to me was "no one came!" Afterwards, I learned that about a third of the class participated. So, "no one" would be a bit of an exageration. But I was saddened that that was her impression. Interestingly, my eldest insisted that she and her partner finish before dark, whereas my younger two kids both came home after dark (they called in advance, to let us know of their intention to collect until early evening). I was proud of my kids, for taking the task so seriously, and working so hard. I hope that next year, my daughter's class will participate more. One in three people will have cancer at some point in their lives. This is not some "fringe" issue. Sieze the Moment! For in a Flash, it is Gone! Last year, all my kids were interested in meeting with my doctor, and asking him questions. I was happy, because I thought they might ask the doctor different questions than they ask me. Also, I thought that the more exposure they had to my cancer world, the less scary that world would be to them. Despite my good intentions, we were just too busy. We did not find the time to meet with the doctor, until now. Well, I guess I did not have to worry too much. My kids are not scared. They are bored. I practically had to beg them to come to chemo with me. "It will be a chance for us to spend some time together..." I cajoled, "I'll bring games... and treats...."
"No offense, mom," began my son, placing his hand placatingly on my shoulder, "but we'd rather spend time with our friends." What happened to those little kids who used to cling to me?!?! Who said I was ready for them to grow up?? "Don't any of you have any questions for the doctor??" I asked, again, amazed at how quickly things change. It turns out, she really did want to ask the doctor some questions. I brought my kids, and my mom, to chemo, on the Sunday between Yom Kippur and Succot. I persuaded MD to tag along, thinking that it would be good for A, and, maybe, he might discover that he has a question, or two, after all. Y had school, so she was out of the picture. Unfortunately, I had misunderstood my doctor. Instead of being in my ward until "at least 11:00," he was in a different ward until "at least 11:00." At around noon, we camped out in the hallway, hoping to catch him. Eventually, he whizzed by. In passing, he called out "1:30, the earliest!" That was too late. My kids were already anxious to be on their way to their friends'. My charm had clearly reached its limit. I stalled them, but... at 1:30, they left, agitated, late to their friends, and without having met the doctor. I asked my mom to accompany the kids to the bus stop. Of course, as soon as they left, the doctor whizzed back. "OK, let's go..." he beckoned. I quickly called my mom. "Did they leave yet?" I wondered if I had done the right thing. My son waited outside the door, while I went in, with A and my mom. We sat down, leaving the door open, so MD could hear, and be a part of things, even if he wasn't in the room. A was sitting solemnly, not exactly pouting, but not her usual, charming self. My doctor, on the other hand, was exceptionally charming. Boy, did he work his magic. Within seconds, he put my daughter at ease. The moment I saw her flash a smile, I knew that I had done the right thing. "So," invited my doctor, "I understand you have a question for me." And then she asked, so sweetly, and so quietly, "What are the sikuim (chances) that there will be a miracle?" Silence. Anticipation, and a child's innocent hope, dangling in the air. "What kind of miracle?" prompted my doctor. "A miracle," she explained, "that the cancer will go away." I wondered, how would he answer that? Then my doctor leaned forward, clasped his hands together, and answered carefully, "Well, every year, and every month, and every day, there are scientists and doctors who are working on, and discovering, new drugs. For example, the medication that is working so well on your mother did not exist three years ago. So, I think that it is... reasonable... to expect a miracle." He paused; then asked cautiously, "How do you think your mother is doing?" "OK," she answered, sweetly, quiet once again. She looked up at me for reassurance, then continued, "she's tired a lot." "And how do you feel?" He asked. "That's good," responded my doctor, "because you mother is doing well. So you should be able to do what every normal kid your age does." "That's what I want!" She agreed, enthusiastically. "That's the key," my doctor said, turning towards me. "What?" I asked, not quite getting it. "They just want to be normal kids.... That's why," he dropped his voice and motioned to the door, "he is out there. And that's what she..." he smiled at my daughter, "is telling you in here." A had gotten her answer, and more. I went outside, and told MD that he and A could run to the bus by themselves, without their grandmother, since she would just slow them down. I did not have to say it twice. In a blink, the kids were off, racing down the hall. "Now how am I going to return the shirt?" queried my eldest daughter, holding up the beautiful white shirt, belonging to her friend from down the block, and looking out the window at the pouring rain. Well, the choices seemed pretty clear to me. Either she would have to wait to return the shirt, or she would get wet (horror of horrors!). It was minutes before Shabbat, and there was no time to drive her. I thought she would choose to wait, but she did not. Ten minutes later she burst through the door. "That was fun!" she exclaimed, shirking off her rain slicker. I woke up late (10:00) Shabbat (Saturday) morning. By the time I put the food on the plata* (hot plate), it was 10:30, and there was really no point in going to shul (synagogue). So I hung out with my parents until Y woke up and joined us. "Why can't we use an umbrella on Shabbat?" She asked, challenging. I tried to explain the reasoning, and arguments, to my daughter, but she challenged me. The halakha did not make sense to her. Perhaps I did not make a convincing argument, because elements of the halakha do not make sense to me. If Moshe were awake, I would have called in the "reserves." But Moshe was still fast asleep. So, in order to explain why we do things that do not always make sense, I tried to explain the halakhic (Jewish legal) process, how halakha (Jewish law) evolves over time, who has halakhic authority, and even when advocates of change overstep halakhic boundaries, etc. I embarked on my explanation, beginning with how our adherance to the halakhic process sustained Judaism for the past 2000 years, giving an overview of modern Orthodoxy, explaining the emergence and downfall of the Reform movement, the emergence and downfall of the Conservative movement, examples of g'dolim (great Rabbis) and how it is their responsibility to evaluate the long term ramifications of halakhic decisions, and examples of changes within modern Orthodoxy (such as the women's tefillah movement**). Ultimately, I was trying to explain why we, as individuals, can't just decide what to do, on our own, based on what seems logical to us. "I got it," said Y, suddenly, as I made my final point. Just like that? Was she really satisfied. I was not sure. Then she summarized in a sentance of two, what I had just spent so much time trying to explain. Without further ado, we segued into a story about Y, when she was a year and a half, and spit up all over a Rav's Shabbat Table. What was the connection? Well, in our previous discussion, I mentioned an interesting conversation I had with this Rav, about women's tefillah groups. As an aside, I mentioned that I had a funny story to tell about Y and this Rav. So, of course, as soon as we finished our serious conversation, Y (and A, who had joined us, somewhere along the way), and my mom, wanted to hear the funny story! So, I told the story, in all its glorious detail! By the time I finished telling the story, it was really late. Most of our neighbors had finished their Shabbat lunch by then, and we had not even started! We laughed at ourselves, for getting such a late start! It was a wonderful, relaxed morning, filled with talking, and sharing, and laughing. * Religous Jews don't cook on Shabbat, so many use a plata (a modified hot plate, with only one setting) to warm up food on Shabbat. Some Jews use a blech for warming food; this is more common in the US. Most Jews in Israel use a plata, or an oven with a special Shabbat setting. 1. Arrived at SZ (Sha'are Zedek) for bone scan. 2. Got the shot that makes me glow, and waited two hours for the scan. 3. In a brilliant, last minute coup, (if I do say so myself) while waiting, I went for a follow up visit to the ENT -- I was supposed to go a month ago, but since my ear was no longer killing me, I had not found the time to get around to it... (missed that exciting saga? see here, here, here, here, here, here, here, here, here, and here). 4. I finished my follow up ENT visit (everything is fine), just in time to go for the scan. 5. Results of the scan would be available on Thursday. 6. I was wiped out! On our way out of the hospital, my mom wanted to stop by and say "hi" to her friend's son, TZ, who runs the ER. I was too tired. 7. We went home and I crashed! 1. Went to oncology to open my port and get a blood test. 2. My doctor whizzed by, and called out to me: "bone scan - no change." 3. Went down to get my CT.
4. Gave the secretary my referral, and happened to notice that the referral was only for a "chest/stomach/pelvis" CT. It was missing only one, very important word: "head." I had requested that we also CT my head, in case there was some cancer activity sneaking around my brain (which might explain the rising markers). 5. Went back up to oncology, in search of my oncologist, to add the missing link. 6. 45 minutes later, mission accomplished, I returned for the CT.
7. The secretary gave me a plastic "jerrycan" of DISGUSTING liquid to drink. I added two full cups of artificial juice concentrate (lots of sugar and food coloring, no nutritional value!). It did not help much. 8. I had to drink two cups to start, and then a cup every ten minutes. Much to the amusement of all present, when I drank, I held my nose and gulped down the liquid. Then I shivered in disgust. (it makes me shiver, just thinking about it). YUCK! 9. I learned, from M, the woman sitting next to me (whom I recognized from chemo), that there is a video camera focused on the CT waiting area. Apparently, she once dumped several cups of her drink in the garbage bin and planters in the waiting area. The CT staff showed her the video of her crime, asking her to refrain, in the future, from "watering the plants!" 10. Two hours later, I finished the drink and had the CT.
11. Went back to oncology, to find out if I would get chemo. The doctor did not know yet. It was 12:10 and I had been fasting all morning (beside that "CT special," Barium drink). I went off in search of food, knowing that as soon as I sat down to eat, I would get the call to come back for chemo. 14. It was after 4:00 when we finally finished! 15. On our way out, we visited with TZ, who is a very interesting, and very nice person. 16. As we were leaving, my oncologist passed by. This month, in addition to his regular responsibilities, he is overseeing "intake" in the oncology ward (the regular ward, not the day ward). This makes him less available to his normal patients (well, I am not sure you could describe me as "normal," but you know what I mean). Despite his outward calm, I can see that this additional job is streching him to the limit. * My oncologist told me that he wants to "sit" on those images for a few days. He wants to examine the images, bone by bone, which will take a while. And he wants to discuss my case in a staff meeting. He is also considering sending the images for an outside opinion, from someone not connected to the hospital (it was unclear if he had someone specific in mind, though I know that he consults with an oncologist at Sloan Kettering). Thursday evening, Moshe and I read the report from the bone scan. It does not look good to me. I will try to stay calm, until we talk with my oncologist on Tuesday. A few weeks ago, I asked my oncologist where, exactly, is the cancer in my bones. He answered that it's all over my skeleton and that there is not enough time to go bone by bone. "... in the shoulders, sternum, the entire length of the spinal column, both sides of the ribs, both sides of the pelvis, hip joints, and femurs." Meanwhile, I will breathe slowly, and try not to focus on this stuff. "I'm just curious," my husband began, "are you always planning to go to Katamon for Simchat Torah?" I want to celebrate Simchat Torah the way I like, without having to "fight" for what I want. That means being somewhere where women dance and sing, with a Sefer Torah. In Katamon, there are multiple venues for celebrating the way I like. I have options,and they are "normal." At night, we went to Shir Hadash, a wonderful, warm, and welcoming minyan, with a lot of ruach (lit: spirit; read: singing!). Though the shul (synagogue) is always packed, the mechitza runs down the middle, allocating equal importance to the presence of both men and women. During Hakafot, one of the two Sifrei Torah was immediately passed to the women. In the beginning, there were so many women dancing, you could barely move. That was just right for me, since I can't move fast these days, and I can't jump around (doctor's orders). As more and more women had their turn dancing with the Sefer Torah, the crowd thinned. At times, I noticed the woman holding the Sefer Torah dancing almost alone. I immediately joined the women who were dancing, and invited others to dance by reaching for their hands (read: grabbing their hands as we passed by). I knew many of the women there, so I knew who to whom to reach out (literally and figuratively). One of the young women there was slightly handicapped (I think both physically and mentally, but it was hard to tell). She seemed eager to be included, and every time I extended my hand to hers, she readily took it and joined the dancing. It was very special to watch her dancing with the Sefer Torah. One of the "regulars" at Shir Hadash is a special young woman, whom I've known for several years. When I met her, she was 13, very close with her mother, always smiling, and so friendly. She gave me hope that a girl could be a teenager, and still be really nice. (I have this primal fear of my dear, sweet children, morphing into evil teenagers). I became friends with her, even though she is much younger. I enjoy her company, and her good nature. It was great "catching up" with her, and dancing and praying together. After shul, we had a quiet dinner with our hosts, R&IP. We stayed with them last year as well; both years, we had a really nice time. We stood under Rahel's beautiful, colorful tallit. I explained to the children what we were doing; then I read loudly and clearly. I always find it emotionally exciting to read Torah; I feel overwhelmed by the power of transmitting God's words. I am especially moved when I read for others, and even more so when I am reading for the children. It is a wonderful responsibility, and a gift. I try to read accurately, both grammatically, and musically. Our tefillah group is very "earthy-crunchy;" most moms in the group (including me) don't really give their kids candies. This year, none of us remembered to bring candies to throw at the kids. My daughter, A, who is a little older, and more experienced, was surprised (read: outraged) that there was no candy! I have been reading V'Zot HaB'racha, every year, for over 20 years. I do not really need to prepare much, since I know the reading almost by heart. Nevertheless, every year, I try to read it a little better (such as emphasizing a dagesh that I might have missed in previous years). And still, I get so excited, and nervous, when I read. It is a real privilege! After shul, my mother (who met us at Shirat Sarah), A, and I walked up the hill to my sister's, for lunch. Thank God, the weather was cooler this year, and the walk was quite pleasant. (Last year, I really struggled in the heat). Lunch was really nice. My sister is a great cook, and a wonderful hostess. As soon as he finished eating, MD asked to be excused. It took me a few minutes to realize he was anxious to walk over to his friend, YB. A left with him, eager to play with the girls where we were staying; she returned a few minutes later. Apparently our hosts had not yet returned from shul. A joined us for dessert, then played by herself for a while, before leaving on her own to try again at our hosts' home. This time, like the dove from Noah's Ark, she did not return. The rest of us hung out, mostly reading, until Yom Tov (the holiday) was over. After we made Havdallah, Moshe pronouced: "Now it's time to do 'everything.'" This year, Y chose to join her Ezra youth group, in going to Lod (a development town), to bring youth and spirit to the town's Simchat Torah celebrations. It was hard for me to let her go, but I realized that I should support her decision to participate in this mitzvah. Several friends encouraged me to let her participate in this giving, and growing, experience. As Y pointed out, "This is something different. I've been celebrating Simchat Torah with you for 14 years; I already know what that is like." After Simchat Torah, Y came back excited and animated. She was also indignant: "Do you know that they did not give the girls a Sefer Torah for even one hakafah?" I smiled wryly as I answered quietly, "That's not surprising. Many places are like that. That's why I like to go where we go." * In Israel, twice a year, during the period between Rosh HaShanah and Simchat Torah, and again from about two weeks before Pesach until after Pesach, the country virtually shuts down until "after the chagim." Offices are closed, or only open part time. Services are limited. And everyone is in holiday mode. It is pretty phenomenal. We were home for Shabbat, Chol HaMoed. It was really nice to sit in our succah. I loved looking up at the pine cones hanging from the ceiling. It was fun identifying who painted what. "Do you see the giraffe pine cone I painted?" I asked, pointing to a yellow and orange pine cone. "I made that one!" protested Y, "and also the pig pine cone!" She pointed to a bright pink pine cone, "you can tell; they have the same face!" "Oh," I said, laughing, "I forgot. I thought I painted it." "Who made that pretty one?" I asked, pointing to a colorful pine cone, "Is that one of mine?" "No, Ima," said A, "I painted that one. You could tell," she added, teasing me, "because it's not perfect, like yours are." (All the kids laughed, as did I; we all know that I am a bit overly zealous about painting my pine cones "just so." I even put on a second coat of paint, so that the colors are strong and vivid. I spend more time painting pine cones than the kids do! It was really nice being together, hanging out in our succah. My dad was still pretty sick. At night, he joined us for kiddush in the succah, but "ate" inside, because it was too chilly for him in our succah. He didn't even really eat. He had a bowl of "Jewish penicillin" (chicken soup), because my mom "made him," and then he went to bed. He was feeling a bit better in the morning, and even had some chicken (a small child's portion, but "real" food, nonetheless). He went to bed, soon thereafter. In the afternoon, some friends came over to Settlers of Catan with MD. That's a great board game! (Thanks Y&ABH!) The boys were loud, but well mannered. It was entertaining to watch them play. Motz'ai Shabbat (Saturday night), after watching Star Trek, and putting the kids to bed, we went to C&DV's Hanukat HaBayit (housewarming) Succah Party. It was a lot of fun. DV is an excellent story teller! He is so entertaining!! I've been friends with CV for years, and I was so excited when they moved into our neighborhood!! Sunday, we went "succah hopping"! We woke up early, and went to B&JS, who decided to be creative this year, and have their succah party in the morning. It was great! When we walked in, there was a giant, mutant etrog on the table and a sign up sheet to "name the etrog." Towards the end of the party, we read out all the funny and creative suggestions! Y really wanted to know "who won?" Apparently, she did. Because IS liked her name ("Etrog the Grouch") the best, and IS was the only one who really spoke up. From there, we went to L&DS, who have an enormous succah on their front porch. Their daughter's Bat Mitvah was on succot, right after they moved into their home. So, they built a giant succah for the Bat Mitzvah, and have been building the same succah ever since! We got to hang with some of our "frisbeechevra;" well, really just L&DS, and LF. R&DJ arrived just as we were leaving. Then we went to my in-laws, who always have a spectacular succah. They have beautiful depictions of the Ushpizin, and pictures depicting the Beit HaMikdash, the kaylim (musical instruments and other utensils, used in Temple worship), and Kohanim (priests). The centerpiece is a large square frame, hanging from the "ceiling", with fruits and vegetables suspended in mid-air. This year, when the kids saw the hanging fruits and vegetables, they were reminded of the succot that the Shomronim built. The similarity was striking, though my in-laws use life-like, plastic, fruits and vegetables. The table was set artistically, below the fruit/vegetable canopy, with a beige tablecloth, highlighted by a royal maroon runner, and beautiful paper plates. My mother in law prepared a feast! We had a wonderful afteroon together. But the day was not over! In the evening, we went to our friends M&SL, who hosted an "open succah," for members of our shul (synagogue), and residents of our neighborhood. I had wanted to go to several of the interesting programs for Hoshannah Rabbah. I was especially interested in a play, "Torn," about a teenage boy's serach for meaning in Judaism. But I was too tired, and went to bed. Though I was interested in the topic, and Moshe tried to wake me, I chose to sleep instead. I was pretty impressed that Moshe actually woke up and went! May that be a sign for the year to come! We arrived at Tel Shilo, at noon, and scouted out the terrain. My friend**, who runs the show there, recommended we begin with the tour. The movie "theater," where the tour began, was packed when we arrived (at 12:30). So, we chose to start with lunch. My SIL did not want to miss the next showing, at 1:00, so she and her family stayed by the theater. I figured, my kids would definitely enjoy the tour more with full stomachs. There were three enormous succot set up, so there was plenty of room for all of us (we were there with Jameel, and five of his seven kids). After lunch, we hurried back, just as the theater was emptying. We were early.... for the 1:30 tour. We snagged front row seats, then took the opportunity to examine the model of the Mishkan (Tabernacle), and take a bunch of pictures. At our first stop, we met several actors, who introduced us to the site. They were talented, and clever, and successfully enchanted the many children (and adults). Then our guide led us past an ancient burial site, to two Byzantine churches. At each site, we enjoyed additional performances. Then we climbed the observation tower, for a panoramic view of the entire area. It is so beautiful there! From the tower, we were also able to view more archeological remains. We met up with my SIL and her family at the site of the Mishkan. There were a few more archeological things to see, such as remains from the Caananites, who apparently also used the site for ritual worship. Others added rosemary to the olive oil, to create an essence for food or massage. At the same booth, the guide made lip balm by melting paraffin (it is best to use bees wax) and adding olive oil, a touch of water, and mint essence (though she was out of the mint essence). We did not have a chance to try everything, but we all had fun. The children had a great time! While there, Muse, and another friend from Shiloh, came by to say "hi." It was great to see them! We also met up with Joe Settler, who was there with his family. Too soon, the sun was setting, and we had to leave. For the drive back, all our kids ditched us, to ride with our friends. That gave Moshe and me about 20 minutes to talk about "the call." We agreed that we would, again, put the topic aside, when we arrived at our friends'. We returned to our hosts, packed up our stuff, and hung out one more time, in their lovely succah. We ended the day with a Bar-B-Q. What could be better than that? After hosting us, and feeding us, for three days, our hostess gave us a care package to take home! Wow. It was late when we drove home, but everyone was happy, and peaceful. * My dad was too sick to join us, and my mom stayed with him, so they could go to the doctor. ** We met in chemo. She also has metastasized breast cancer, and she is in the same bone-drug experiment. The nurses introduced us when I first began treatment, and she was very helpful and supportive. She is AMAZING. She told me that she works at Tel Shilo. Only later did I learn, from mutual friends, that she runs the Hadracha (education) program! Ever since Pesach, we have wanted to go back to Har G'rizim to visit the archeological site, which include remains of the Shomronim (Samaritan) Temple (destroyed in 128 BCE). Their Temple is of particular interest to us, since it was built similar, in style and size, to the Beit HaMikdash (Israelite Temple) in Jerusalem. Unfortunately, we were unaware that the archaeological site was only open until 12:00. When we arrived, the gate was already locked. What a bummer! Moving on, we went to a lookout point, where a succah was set up for soldiers. We ate our "picnic" lunch in the succah, then looked out over Sh'chem, to see Kever Yosef. After taking somem pictures, we went back to the visitor's center, and visited Yefet's succah. It was quite beautiful. The succah was an "awning," like a panel, made of one layer of hanging fresh fruit, in geometrical patterns, with an enormous etrog as the centerpiece. Above the fruit, lay s'chah, freshly cut, leafy branches. We wanted to visit their Kohen Gadol (High Priest), but he was not available, so we went to visit one of his grandson's. His succah was similar in structure, but had a very different geometrical pattern, and three larget etrogim in the center. From Har G'rizim, we went through Itamar to the beautiful organic farming community, Giv'ot Olam. Giv'ot Olam was founded in 1966 by Avri Ran. Among other impressive qualities, Giv'ot Olam is a haven for wayward youth, who are searching for meaning in their lives. Avri Ran is well known for opening his home to any Jew who wants to live there. Some of these lost souls arrive at the community, leaving behind a world of drugs and immorality. At Giv'ot Olam, they work the land, and learn to live in peace with themselves and others. Not everyone comes from such difficult backgrounds. Many of the youth come from strong families. They want to be a part of this ideological community, that still believes in Avodah Ivrit (Jewish labor), living without fences, working the land, protecting one's own home, and living communally. All members take pride in their community, working, defending, and enjoying the land and each other. We arrived, and immediately felt at home. The serenity of the hilltop was inviting. The grass grew long, the olive trees stood magestic, the wind rustled the leaves, everything evoked harmony. The central structures, were the wooden communal dining hall, and the large, round, stone and wood succah. The landscaping was simple, rustic, and beautiful, with an artistic central garden, decorated by stone structures. Our friends kids went to feed the goats. My daughter, A, wasn't feeling well, so she settled herself in a lounge chair, in the beautiful country succah. Also in the succah, sitting along the very long table, was another visiting family, with about 30 people, from several generations. Our older kids, and their friends from another family, found a simple playground, to entertain themselves. Later on they moved to one of the large grassy areas. At one point, community members opened their local dairy for anyone who wanted to purchase their organic goat's milk products (milk, yoghurts, cheeses, etc). We purchased some fruit yoghurts and some hard cheese. The community also produces organic eggs (they are the largest supplier of organic eggs in the country!) and has a flour mill and organic bakery. As the sun was setting, and we were leaving, we met a young man, who had recently finished his army service and was working on the farm. He smiled warmly, and spoke easily about what drew him to be a part of this community. As we drove home, I breathed deeply, trying to hold onto the peace and tranquility that still surrounded us. We are having a wonderful Succot! Good friends invited us for the first chag (holiday) of Succot (Monday evening and Tuesday). To my surprise, and delight, when they heard that my parents are visiting, they extended the invitation to include my parents. As we discussed our Succot plans, our hosts expanded the invitation, to include several days that we would spend together, touring the Shomron (Samaria region). I was excited about the opportunity to spend so much time with these friends, who are so special to us, but who we rarely see. Their succah was decorated with beautiful pictures, of the Seven Species (put out by Beit El), the Beit HaMikdash, and Kever Yosef (Joseph's tomb). The picture was like a beacon, signalling what was, and what could be. If we truly treasured our holy sites, Kever Yosef would still be standing intact and unmolested, and Jews would have free access to visit and worship. 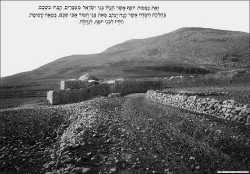 Interestingly, Kever Yosef is one of the three sites listed in the Bible as having been purchased. The other two are Me'arat HaMachpelah (The Tomb of the Patriarchs) in Hevron, and Har HaBayit (the Temple Mount) in Jerusalem. During dinner, which was delicious, children from the neighborhood came to visit ("Succah hopping"). There were no adults accompanying these groups of small children, who roam freely in the yishuv (community settlement). Some of the children had prepared divrei Torah (snippets of Torah study), and all were carrying small bags, filled with candies and snacks they had already collected from other succot (pl. succah). After dinner, some other friends of ours, T&MF, surprised us by popping over to visit. We all hung out in the succah, laughing and telling stories. Later, we found out that all our kids had disappeared, along with our hosts' kids. They felt right at home on the yishuv, and went succah hopping with their friends. It was nice. The next day, we went to lunch by other friends, J&DS. There, too, our kids felt very comfortable. We were able to hang out talking, while our kids did their own thing. I did not have to worry about my kids at all. They completely integrated into yishuv life, and were totally happy to be free and on their own. We all had a terrific chag, filled with good company, good conversation, good food, and good fun! This post was supposed to be a really positive post, all about the first day of Chol HaMoed (visiting the Shomronim on Har Grizim, then going to Giv'ot Olam, an organic communal farm, between Yitzhar and Itamar), and the second day (at Tel Shilo). Somewhere along the way, I was also going to mention how I seem to be out of my slump. But, today, at Tel Shilo, right as we were walking around the area where most archeologists agree that the Mishkan stood, my oncologist called me up. "Where are you?" he asked. "I'm at Tel Shilo; where are you?" I responded, trying to be light-hearted. "I'm at the office. When will you be back in Jerusalem?" he responded, no-nonsense all the way. "Tonight. Why?" I finally realized this was not simply a friendly call. "I want you to do a CT on Sunday." BAMM! "Your markers are still rising...." BOOM! I look around me, at the serene archaeological site. I want to hang up the phone, but I cannot. CRASH! "I would really rather not come in on Sunday..." I say, thinking about our plans to spend the day with family and friends. "We need to get the CT results before you receive your next treatment." He says, slowly, making sure I understand. "I am not scheduled for chemo on Sunday," I remind him. Our group is moving on. I do not want to miss the explanations of the site. I get off the phone. Moshe has questions for me. "Let's deal with this later," I suggest to my husband. He agrees, even though it is hard for both of us. The plan is to go to Tel Shilo on Thursday, the second day of Chol HaMoed Succot. There will be a big festival at the site on Wednesday and Thursday, with a living museum (period actors), guided tours of the archaeological site, and sadna'ot (workshops). Entrance is 25 NIS per person, or 90 NIS for the entire family, all inclusive!! The site will be open from 10:00 am to 5:00 pm. Last year, we built our own succah for the first time since we moved into our own apartment. My father, an engineer, and my brother, an industrial designer, oversaw the construction, with Moshe and MD as extra hands. The kids and I were in charge of decorations. The men-folk built the succah out of two partial metal frames, two mesh walls, wooden beams, and s'chach la'netzach (re-usable s'chach).We have extremely strong winds here, so the most challenging element of construction was securing the s'chach. This year, my brother is not here, and my dad got sick. So Moshe and MD were on their own. MD jumped at the chance to help his Abba (father) build the succah! They started on Friday, the day after Yom Kippur. That first morning, they brought out all the pieces from storage (a major schlep job) and built half the frame. Saturday night, after Shabbat, They completed the frame and attached the sides. Then Sunday night, after Moshe got home from work, they tackled the main job: attaching the s'chah. My dad was a handy consultant, but Moshe and MD did the work. Laying down the wooden support beams and covering them with the s'chach was a time-consuming, though relatively straightforward job. But securing the s'chah with support beams on top of them was a real challenge. My dad really helped with that. MD really rose to the occasion, and helped good-naturedly, until almost 2:30, when he announced that he had to go to bed. He was really tired. What a trooper! As Moshe was securing the final few pieces, he wiped his brow and exclaimed: "this is like building a house!" That gave us all a laugh. Moshe and my dad finished the job, around 3:00 in the morning! We have one serious succah! "No! Don't say that!" she said, so adamantly. I was surprised, but I should not have been. It was not the first time my youngest daughter reacted this way. At first my daughter was annoyed by things the speaker said that "were not true!" But, eventually she asked several questions about the things that confused her. Last night, she asked about a machine the man said would cure cancer. (I think she was referring to radiation treatments). During our conversation, she mentioned my friend, TK, who "has what [I] have." I clarified that we do not have the same type of cancer, but that we both have cancers that will not go away, unless God makes a miracle. "No! Don't say that!" said my little girl, with an earnestness, that was cute and, at the same time, heart wrenching. "You need to trust in God," she continued, "that He can make miracles." "Don't say 'unless.'" she commanded, pouting a little. "I'm sorry." I apologized, "We will have cancer, until God makes a makes a miracle..."
"Is that better?" I asked, tentatively. "Yes!" she said, adamant again, this time with a half smile. "Come here," I beckoned to my serious little girl. I wrapped her in my arms and hugged her tight. Here I was, thinking I was so put together. Despite serious back pain, both (dairy and meat) dishwashers were going, and I had already started a load of laundry. "TURN OFF THE WASHING MACHINE!!" I shouted, quickening my pace! But they had never turned off the machine mid-cycle. They did not know how. I knew the water must be dripping out of the bottom of the machine; I must not have properly closed the filter plug, when I cleaned the filter out on Friday. I sloshed through the water, which was spilling out of the bathroom. Wondered how a trickle could cause such a flood, in such short a time, I glanced at the bottom of the machine. Water was shooting out of the filter plug. It wasn't sealed at all! My daughter jumped out of the way as I reached past her to turn off the machine. Then I called for someone to get the magav (a long squeegee on a pole, which Israelis use to mop their floors). I did not want to wade through the water again. As I waited, I watched the water spreading through the hallway, and under the cabinets/bookshelves (you know, the cheap ones that are fine if you keep them dry....). My youngest daughter arrived with the magav. I did my best to mop up the water, before it could spread further. She tried to help more, by sopping up some of the water with smartootim (special rags that Israelis use with the magav, to mop the floor), and ringing them out (back-breaking work, for us older folk). We managed to direct most of the water down a drain hole in the floor. Then, when the crisis had abated, I assessed the damage. It could have been worse. Calmly, I removed the filter plug and inserted it properly. Then I added more soap and restarted the machine. It's the Plumber, I've Come to Fix the Sink! Well, today, I had to call the plumber... to fix the toilet. The annoying noise, that we have been living with for months, finally transformed into a full-fledged leak. With my parents visiting, we are seven people. One working toilet is not enough! So today, we called a different plumber. When he rang the bell, I promplty prounounced: "It's the plumber, he's come to fix the....toilet!" What can I say? I amuse myself! Wishing everyone a meaningful Yom Kippur and a happy and healthy new year. Please forgive me for anything I might have said, done, or written, that caused you anguish or harm. I thought I was so smart, and responsible. I did not want my car to break down during Sukkot (like it did last Pesach). If I wanted to take care of the car before my parents arrived, I had to do it this morning. I brought my car to the shop, in Talpiot, around 9:15 am. After I dropped off my car, my friend, RD, picked me up and we drove to Malcha Mall, since both of us had errands to do there. I needed to repair several broken mobile phones -- another thing I wanted to take care of before my parents got here. We dropped off the phones, went to the hardware store, then to Sambuki's (on the first floor of the mall). We ate these yummy, freshly baked, "pizza-like" things: tasty, crusty dough, topped with a generous portion of pesto, Bulgarian cheese, sun-dried tomatoes, and roasted peppers. Delicious! Then we picked up the phones, left the mall, did a few more quick errands, and headed back to Talpiot. We had just parked the car, when Moshe called. "How are you feeling?" he asked, with concern in his voice. Now, my husband is a sensitive guy, and all that, but something was wrong. "What's going on?" I asked, suspiciously. "Well, a few minutes ago, everyone, and I mean everyone, on the first floor of Malcha Mall started coughing uncontrollably. They are evacuating the area...." he continuted, "How are you feeling. "Please let me know," I answered, "if we need to go get checked out." It was pretty spooky to know that we were just there, and missed the attack by a matter of minutes. Back to the mundane: my car was not ready. We went back to the car shop to wait. Eventually, RD had to go. I waited another two hours. In hindsight, I should have gone back with her. I could have been with my kids for two hours, and taken a cab back when the car was ready. Oh, well. But that's not the worst of it. "What do you want first," asked the agent, when he finally approached me with the keys to my car, "the good news or the bad news?" "Bad news first," I answered, naively unaware of the hammer that was about to fall. There is something wrong with the computer that controls the break system (ABS). Replacing it will cost around 7,000 NIS, not including taxes and labor! "How can that be?" I ask, shocked beyond imagination. "How can it be so expensive?" "You will let me know what you decide," he replied gently. "We did not get a chance to fix some of the other problems," he continued, "You will have to bring the car in again." I left the shop at 5:15, exhausted, both physically and emotionally. On the way home, just after I picked up my son, my daughter called. My parents' plane landed an hour early; my sister already picked them up. They would arrive at my home within the hour. So much for starting off our visit on the right foot! I focused on my breathing and tried to stay calm, as I tidied up whatever I could, before they arrived. God bless my daughters. A cleaned her room and Y set up the beds, before I even got home! Everyone pitched in to help. God bless my parents. They did not say a word about the mess when they walked in the door! Though chaotic, the evening went surprisingly well. The kids are sleeping peacefully. All four grown-ups (Moshe, my mom, my dad, and I) are each doing our own thing, on our own computers. The car will have to wait another few days. My Parents are Coming! My Parents are Coming! OK, so no one is out there ringing the bells, but I am still excited..... and a bit apprehensive! I really want this to be a good visit. Now would be a really good time for God to help me model Kibud Av Va'Em. Besides needing to set a good example, I really want to treat them right. Besides, I miss my parents.... a lot! So, when they are here, I want to maximize our time together! I also want to show them how much I appreciate them! My parents, especially my mother, pushes my buttons. You might think that, at this point, I would stop acting like a 14 year old when I am with my mom. The thing is, my daughter is 14 years old. And I do not want her acting like I do. Not now, and not in another 30 years. For years, Moshe has been telling me that the educational message I deliver by my actions, is far more influential than the educational message I deliver by my words. Grudginly, I admit to knowing that he is right. When you pray for me, please pray that God gives me the strength to fulfill the mitzvah of Kibud Av Va'Em. And, if I do it right, everyone wins. On Tuesday, Sept 22, I came late to chemo. My friend had a son, and the brit was that morning. I called in advance, and both my doctor and the head nurse approved the late arrival. We agreed that I would arrive by 11:00 am, and that I would call earlier in the morning, to remind them to prepare my prescription. Well, I remembered at 7:30 (too early to call), and forgot at 9:00 (the right time to call). So, they ordered my prescription when I arrived, at a quarter to 11:00. The delay might not have made a difference. That day, there were several prescriptions which were delayed for unknown reasons. Unfortunately for me, the delay would have significant repurcussions. I was scheduled to get all three drugs that day: Herceptin, Navalbine, and Zomera/Denosumab. I was also scheduled to get a full-body x-ray for the bone drug study, but that was not such a big deal. I was able to get the x-ray while I was hooked up to the Herceptin IV. The Herceptin took a long time. If the drip is too fast, I have an allergic reaction (pain in my chest, as if someone is squeezing my sternum). At 3:30, one of the nurses informed that if I did not finish by 4:00, I would have to return the following day, for the remainder of my treatments. On several occasions, over the past few months, I finished receiving my treatments around 5:00 pm. So I did not understand why she insisted I return, when I would be finished by 4:15 or 4:30. The doctor on duty approached me, and explained (rather harshly) that it was her responsibility to be there while patients received their treatments, and she had to leave by 4:00 (since she had a clinic across town). I was quite taken aback by the hostile way she spoke to me. Though I was not the only patient still receiving treatment, she scolded me, saying "because of you, I cannot leave, and all the patients at my clinic will be treated late!" I understood her time constraints, and appreciated the fact that she did not want to keep her patients waiting. Still, she could have said "I understand that it is disappointing, and inconvenient. I am sorry, but there really is no other choice." She was completely insensitive and unsympathetic. The nurse on duty saw that I was distressed, and offered to leave my port open, so that I could come to the hospital in the morning, get hooked up right away, and finish quickly. I appreciated her attentiveness and consideration. The next day, I discovered that there were further consequences from the delay. I would not be able to have my next treatment the following Sunday, before Rosh HaShanah, as originally planned. I dreaded the thought of coming in on the Thursday after Rosh HaShanah. I knew the ward would be swamped after being closed for three days. Moreover, I would be anxious about finishing in time to teach swimming. And, I did not know if I would be able to teach, since I am extremely tired and worn out by the time I get home from chemo. My doctor, and the head nurse, agreed that I could come in on Sunday (today) for the next treatment. Well, if I thought the ward would be any less crowded, I was sorely mistaken! This time, I was instructed to arrive late. I was only getting Navalbine, so it would not take that long. I arrived around 10:30 (instead of the usual 9:00). It took almost three hours for the pharmacy to deliver the drugs and for the nurses to hook me up. It usually takes one hour; on rare occasions, an hour and a half. But never THREE hours! By the time I finished, I was completely finished! I really wanted to go straight to sleep when I got home, but Moshe had to work late, and I had to be around for the kids. At 10:00 pm, my phone rang. "Why are you up?" asked the caller. I was not certain how to answer him, since I was exhausted and wondering the same thing myself! My doctor, God bless him, was calling to check up on me. He had sent me, via email, a referral for a bone scan, and he wanted to be certain I received it. 10:00 pm and he was still working! Have I mentioned recently that I really appreciate my doctor? Anyway, now, finally, at 11:30 pm, the house is quiet and I can go to bed. I am nauseous and itchy, thanks to the chemo. Hopefully, that will pass. Meanwhile, I am not looking forward to my next chemo day... next Sunday. As one of the nurses said "days like today make one wonder if the chagim (holidays) are worth it!" If not a major post, then at least a THANK YOU to all my "coffee and chemo" dates! The day came and went! I want to thank all my friends who came to hang out with me at chemo this past year! You guys took what could be a real drag and turned it into fun! I really looked forward to my coffee-and-chemo-dates! It was so great to spend time with each and every one of you!! A few of you came on really crazy, stressful days. We barely had a chance to sit and talk. I truly apologize for that. (most days were not like that, really) Thanks so much for being understanding!! Some days, I had so much fun, it was..., well..., it was rather strange. I mean, how could I have such a good time at chemo? But I had to be there for the chemo! Why not make it fun? So, thanks for the company! Thanks for the support! Thanks for the snacks/lunches! Thanks for playing games with me! Thanks for the amazing conversations! Most of all, thanks for hanging out in the chemo ward, when you could have been anywhere else! You made this year a good one! *cancer-versary -- great expression coined by Noa! The call of the Shofar opens the gates of heaven. It is our heartwrenching cry to the Master of the Universe, to hear our prayers, and have mercy on us. It is a symbol, to remind God, of the ram that Abraham sacrificed in Isaac's stead. We hope that, even if we are not worthy ourselves, God will remember our forefather, who was ready to sacrifice his son. We stand, humbled, wailing to God. The first day of Rosh HaShanah, as the first sounds were heard from the Shofar, I felt the gate of heaven open, and knew that God was listening directly to me. Silently, I prayed to God. I want to live. Please, let me be written, for another year, in the book of life. As I stood there, with my eyes closed, praying to God, tears suddenly burst from my eyes. Embarrassed, I quickly lifted my open machzor (prayer book), and covered my face. The sound of the Shofar continued to carry my desperate plea. With every t'kiyah (call), more tears fell, as, silently, I begged God, please, let me live. Emersed in my private dialogue with God, I heard a voice calling me back. Standing next to me, my worried little daughter whispered ever so quietly and sweetly, "Ima, why are you crying?" I put my finger to my lips, indicating that she should be quiet. We do not talk during t'kiyat haShofar (blowing the Shofar). But that is not the only reason I did not answer. I was overwhelmed by the power of prayer. I could not do anything, but plead with God, while those gates were still open. There are several sets of t'kiyot during davening. During each set, I focussed on different prayers: I prayed, by name, for shidduchim. I prayed, by name, for good health (mostly for other cancer patients, but also for others). I prayed for our country. I prayed for my family. I prayed for help, in cleaning my home, and being a better parent/wife. I prayed, and prayed, and prayed. I did not cry every time, though I cried a lot. But I prayed stronger than I have ever prayed before. Background: I though I was going to have chemo on Sunday, so I made sure to set us up for meals on Rosh HaShanah. In the end, chemo was postponed one week, but we still were invited out for all the meals. We had such a wonderful time! Arrived at shul (synagogue) late. Missed davening (prayers), but got to socialize! Dinner at O & Y G's. Great conversation!! TG, their eldest daughter, was studying for her 12th grade bagruyot (national exams) in safrut (literature). She kept "testing" the other kids about words (which none of them knew!). For hours, the kids sat around learning new words and laughing! It was SO COOL!! Shul began at 7:15. I arrived at 9:15. Perfect. The kids and I davened Shacharit (said our morning prayers). Then, we joined the shul for kiddush (blessing over wine, sanctifying the day), followed by some pastries and snacks, and saying "hi" to everyone! It was fun. Then, at 10:15, we went back into shul for t'kiyat shofar and musaf (additional prayers). I enjoyed the davening, which ended around 12:30. There was a lot of singing. We went to Y & A C for lunch. Y is in Ezra (youth group) with their eldest daughter, D. Conversation was much lighter than the night before, but no less interesting. Lunch was a lot of fun, and we talked for a long time, before benching (reciting Grace after the meal). The kids took a break in between, to play cards, and basketball. When Moshe and I left, our kids were still there, throwing hoops. Moshe went home to rest, but I stopped by my friend IA, who lives in the same building as the C's. We hung out for a while, then we popped over at RD. I wanted to introduce IA to RD, and that seemed like as good a time as any! Almost as soon as I arrived, I left to go to shul, to daven ma'ariv (evening prayers). On the way, I deliberated going home, to make sure that my family was on awake and coming to shul. If I went home first, I would be late to shul. I decided that my family would be okay without me and that I wanted to be on time to shul. As I was about to walk in, I realized that one of my earings had fallen off. I rarely wear earings, but I was wearing my one and only really nice pair, in honor of the holiday. It was already dark, and I realized that the chances were slim that I would find the earing. I quickly retraced my steps, silently praying to God to help me find the lost earing. All sorts of scenarios flashed through my mind (eg. when I hugged my friend good bye, me earing might have gotten caught in her scarf. Then, as she walked in the opposite way to her shul, it could have fallen off anywhere...). I was almost all the way back to RD's home, when I glimpsed something out of the corner of my eye. I backtracked, bent down, and.... there it was! I couldn't see it, but I feel it! I stood up, and thanked God. Then, I practically raced back to shul! When I arrived, they still had not started! I walked in. There were almost no women there. Just the Rabbi's wife and daughter, another handful of young teenagers, including Moshe's cousins, and me. I glanced into the men's section, and did not see my husband. I tried to relax. I would trust that Moshe and the kids would be there. We had dinner with J & Tz B. It felt like eating with family! Our kids are totally comfortable in their home. MD and E, their second son, have known each other since gan (kindergarten). A loves playing the "older sister" to LT. And, when she got tired of the adult conversation, Y just hung out on the couch, reading one of their books. We "grownups" talked for hours. It was just so nice! They live really close to us, so the walk home was easy, despite the late hour. I arrived a bit later the second day. But davening was more or less the same. There was more singing, which I liked, and good ruach (spirit). For lunch, we walked down to C & D V, in Shlav Bet (the second stage of building), which is down in the valley, and a bit of a walk, all downhill. They just moved into the neighborhood, but I know CV (one of three CVs I know!) for years! (I know her since before I was married, but we became good friends when my eldest daughter was little) I could hang out and talk with her all day long... and I did! We played a fun, new game "Apples to Apples," which is meant to be a kid's game, but is so much fun when played with adults or older kids! We played one game with the four adults, and two more with CV, the older kids (two of her triplets and Y), and I. We all had a lot of fun! Before we knew it, the holiday was over. Moshe and Y both left with borrowed books, and CV was kind enough to drove us back home (up the mountain). Once we walked in the door, it was back to business! As strange as it felt to be returning to the "real" world, we could not forget that it was a school night! Thanks to A, everyone got ready really fast, and we sat down to watch Battlestar Galactica (which we hadn't watched in months). It was a full, and festive, holiday!